The Skints, Vin Garbutt, and Liberation Day - three big gigs for us in the next couple of months. Celebrating 70 years of the Island's liberation at the end of WW2, The Vale Earth Fair Collective is putting on a full programme of live music as part of the St Andrew's Celebrations at the Last Post on Saturday 9th May - check the Events page for full line up details. Next up is Vin Garbutt at the Fermain Tavern for a joint gig in collaboration with The Guernsey Folk Club, with Esther Rose Parkes, Blue Mountains and Phil Capper providing support. Its on Saturday 23 May at the Fermain Tavern, Tickets £12 advance, £15 on the door. Supporting Vin will be Jersey singer songwriter Esther Rose Parkes, blues folk duo Blue Mountains and Phil Capper, and the music starts at 8pm. Vin’s career has spanned over 40 years of constant worldwide touring, which must make him some kind of elder statesman of folk. His songs were inspired by the folk tradition at the beginning of his career, and they still are, but have transformed into gritty social comment and life observations. He is renowned for his hilarious intros but for him his song lyrics are the crux of his performance. This will see the Vale Earth Fair joining forces with The Get Down for a gig at the Fermain Tavern, with MC Deemas J & Count Skylarkin warming up the crowd before The Skints hit the stage. Limey Banton, Rentoclean and DJ Four Q complete the bill. Tickets are on sale now through the Vale Earth Fair website, priced £20, and they are expected to sell out, so get in there early! If there are any left on the night they will be available for £25 on the door. The Skints are a four-piece reggae band from London, described as “the torchbearers for modern British reggae music.” Describing their own sound as “music from Jamaica in a London style,” The Skints mix reggae, ska and dub with touches of grime and hip-hop; a contemporary style that draws as much from the streets of the UK's capital as it does from the Caribbean. 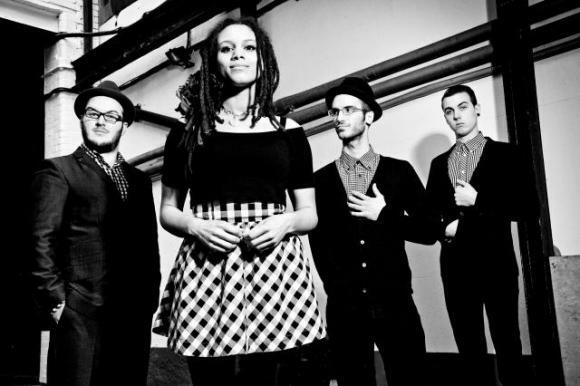 Playing hundreds of shows since 2007, The Skints have had a steady rise to become UK underground stars, with even The Guardian confirming that The Skints “brought the house down” at 2014's Reading Festival. The Skints’ newest album, FM, was released via Easy Star Records in March, and is their strongest to date, showing continued development in their songwriting, musicianship, studio prowess, and ideas. Produced once again with British reggae vanguard Prince Fatty (Hollie Cook, Lily Allen) at the controls, it includes guest spots by Tippa Irie, Horseman, grime MC Rival, and even a surprise appearance by comedian Rufus Hound. Currently on tour in UK and Europe to promote the album’s release, they head to the US at the end of the month for a string of dates with Easy Star All-Stars and Fishbone. When they return they will be popping over to Guernsey before a string of festival dates over the summer. The Skints' previous full-length, Part And Parcel (2012), saw them fully transform the energy of their live show into a stunning sophomore release. The album was an instant critical hit, with Rock Sound declaring it a “modern dub, reggae and hip-hop inspired classic.” Their ascent continued across 2013-2014 with a remarkable run of European festivals including Reading and Leeds Festival and Radio 1's Big Weekend and a memorable set in the rain in front of a 10,000 strong crowd of die-hard Skints fans at Boomtown Fair. The band ended 2014 with the Jagermeister Music Tour selling out Brixton Academy in the process. Not bad going for a band who started out as friends at a culturally-mixed London school back in 2005. The Skints have progressed from playing squats to stages and refined their identity from punk ragga urchins to become an outfit deemed “the most accessible pure British reggae music you'll find these days. When fans and critics hear FM, they’ll hear a band that has come a long way from those humble beginnings”, with FM just missing out on a top 40 spot in the UK album chart on released last month. It’s hard not to hear FM and get excited wondering about what the band will do next. Get out to see the band live if you can. While based in Guernsey recently MC Deemas J was renowned for his frustratingly in-frequent Old Time New Time Sounds sessions at the Townhouse with our own Limey Banton on the decks. Now based back in London and off the back of the critically acclaimed “Wrongtom meets Deemas J In East London” album released on Tru Thoughts in 2012, this is the perfect opportunity to bring Deemas back to Guernsey. Deemas started with reggae music when he was very young doing things with small sound systems in and around London. He then moved on to the drum and bass scene where he kept his reggae style and built on his early reputation as sound system MC. After returning back to his reggae roots with Germany’s Bombastic sound system, and setting up the Old Time New Times Sounds with Limey, Deemas’ collaboration with Wrongtom finally saw his creativity as an MC developed in the studio. The result is the essential reggae, dancehall and dub fuelled LP, with a deep, fresh and bouncing vibe rooted in East London that pays homage to the culture and sound that first got them both hooked back in the ‘80s. Joining Deemas J on this occasion will be Count Skylarkin, founder of Oxford’s Skylarkin Sound System. From compiling mix tapes in the early 90s to touring with The Wailers, remixing for Trojan Records and performing in front of thousands at festivals all around the world, Count Skylarkin has been making people dance for the past 20 years – specialising in new and vintage reggae, rocksteady, Jamaican ska, hot swing, jump blues, dancehall, hip hop and jungle vinyl, turntablism, pork-pie hats, dapper suits, good times are guaranteed. Over the years The Count has shared stages, decks and rum with such musical luminaries as The Wailers (2009/10/13 UK Tour DJ), The Specials, Toots & The Maytals, Lee ‘Scratch’ Perry, The Skatalites, Prince Buster, Alton Ellis, Max Romeo, Susan Cadogan, Mad Professor, David Rodigan, Don Letts, Jerry Dammers, DJ Derek, Trojan, DJ Yoda, Massive Attack’s Daddy G and Horace Andy. As co-founder of The Disco Shed he has made headlining appearances at numerous summer festivals, including Bestival, Latitude, Leeds, Reading and The Big Chill. Shedless, The Count has also rocked Glastonbury, Shambala, The Secret Garden Party, Notting Hill Carnival and countless others. An authority on reggae music, he has written for several music publications, including NME.